M1942 Jumpsuit (unreinforced): The main uniform of the paratrooper from stateside training through the Normandy campaign (the 504th retained their jumpsuits through the Holland campaign and they occasionally in evidence on troopers in Germany). Paratroopers in 1st and 2nd battalions of the 504th appear to have painted their jumpsuits with aircraft paint to give them a bit of camouflage. 3rd battalion troopers, who jumped a day earlier with the 505th P.I.R., did not. M2 Helmet (“D-Bale”): Some paratroopers added camouflage to their helmets with the aid of vesicant detecting paint that would change color in the presence of chemical weapons. Other troopers would add unit symbols to their helmets; there is evidence that the 504th utilized an “Ankh” symbol in Sicily, but these are rare. NCO’s would often add a horizontal stripe to the back of the helmet while officers would add a vertical stripe. Khaki helmet nets with 1″ holes are common in Sicily as well. Jumpboots (Corcorans): In russet brown. The pride of the paratrooper. Invasion flag armband: This appears to be another item exclusive to 3/504 and the 505. 1/504 and 2/504 troopers sewed their flags directly to their jumpsuits. Rigger-made ammunition pouches (“Rigger pouches”): Photographs show a bit of variation in the number of rigger pouches and how they were worn. It appears that 504th troopers preferred to carry 2 on each side of the pistol belt buckle in the front while 505th troopers might carry 1 in the front and 3 or 4 in the rear. This is an instance where personal preference and comfort could dictate how and where they’re worn. Parachutist first aid pouch: This was worn in a variety of places, but mainly seen on the ankle or combat suspenders. 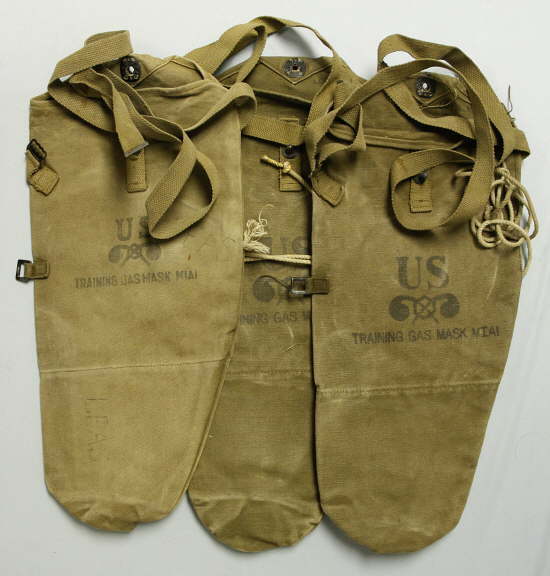 M1A1 Training gas mask & bag (not pictured): Due to a shortage of the service gas mask and the smaller size of the training gas mask, the paratroops in the MTO carried the training mask. These would often be discarded shortly after landing on the ground when it was apparent gas would not be used against them. Spare magazine bag (not pictured: Although intended for Thompson submachine gun magazines, it appears that 504 riflemen obtained these to carry extra ammunition (riflemen with the spare magazine bag are often wearing fewer rigger pouches). M1905 Bayonet: This unwieldy 16″ bayonet seems to disappear from troopers as the campaign goes on. M1918 Trench knife (“Knuckle knife”) in M6 scabbard: These holdovers from the Great War were issued to paratroopers in the MTO. Special thanks to Matt James for his research and photographs! Original photographs of the 504th in north Africa and Sicily can be found here.